Roger Coigny has lived in the mountain community of Pinehurst for most of his 75 years. He’s seen a lot of changes, but nothing like the millions of Ponderosa pine trees here in the Southern Sierra Nevada that have died over the past two years. “And the ones that die the quickest are the biggest, most beautiful, tallest and strongest,” he says. The trees are stressed and dying after more than four years of unprecedented levels of drought, plus an infestation of bark beetles. Last summer, the massive Rough Fire tore through stands of dead trees in nearby national forests, burning more than 230 square miles, including part of Kings Canyon National Park. The fire burned close enough to Pinehurst that people were forced to evacuate. Coigny put his six dogs, 1,200 pounds of tools and his clothes into his Volkswagen bus and headed down to the town of Selma near Fresno. 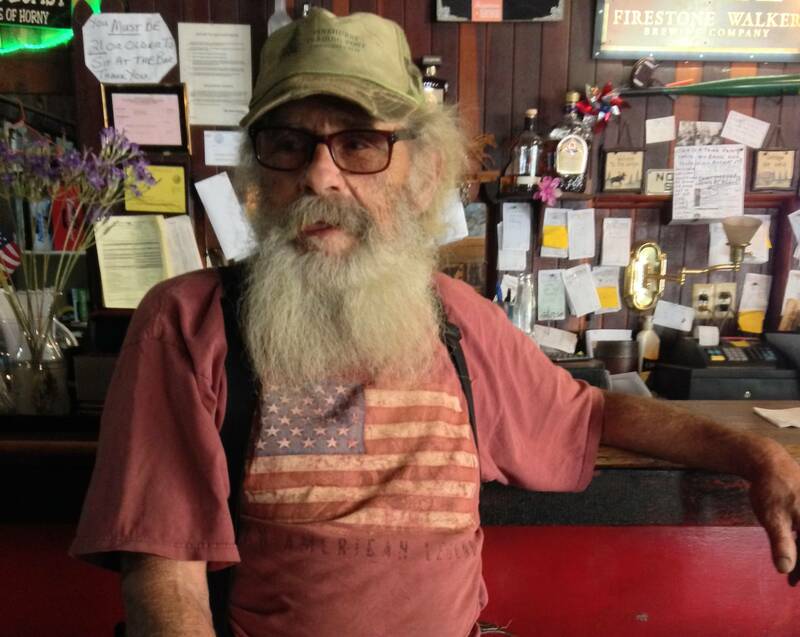 When he returned a couple of days later, his house and property were covered in ashes, but they survived. This summer the forests are at risk of burning again. Coigny looks up from his burger and fries inside the Pinehurst Lodge and Restaurant and points out the window to a nearby mountain. He sees mostly dead Ponderosa pines in the distance, heavy with brown needles. After lunch, Coigny leaves the pub and walks over to his white Volkswagen bus. He opens the front door and three dogs leap out. He calls one of them over. Pinehurst resident Roger Coigny monitors a scanner to keep track of wildfires near the home where he lives with his six dogs. “Chief, come here!" Coigny calls. "Come here, sing me a song.” Coigny offers up a "Wooo Wooo" to lure the dog into joining him. But he’s out of luck. Apparently Chief doesn’t sing on cue. Coigny and his six rescue dogs live on a good-sized piece of land, and he wants to stay on top of any news about fires. 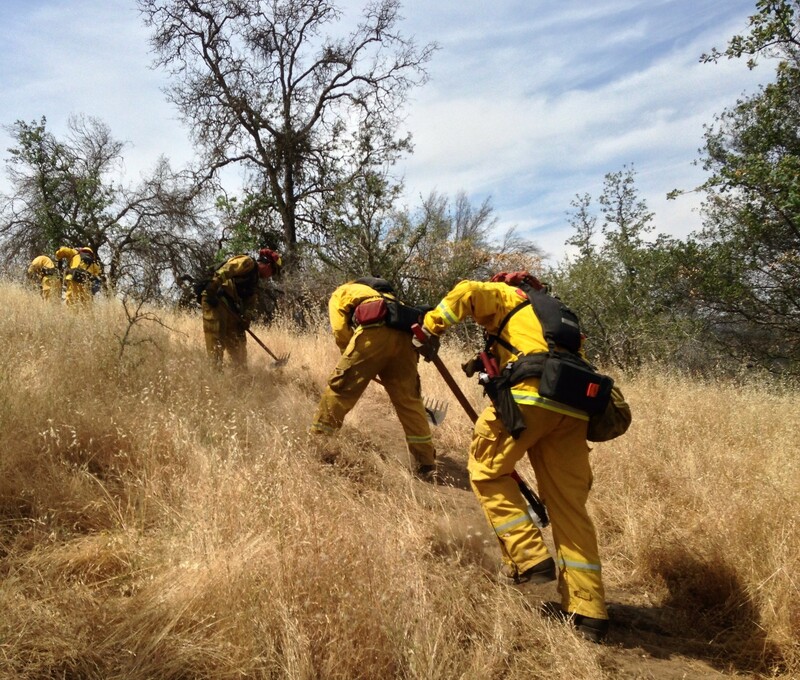 On a steep trail in the Sierra foothills, not far from Pinehurst, a crew from Cal Fire practices cutting a fire line between tall, golden grasses. Steady rain this winter brought a lot of new growth to the foothills. 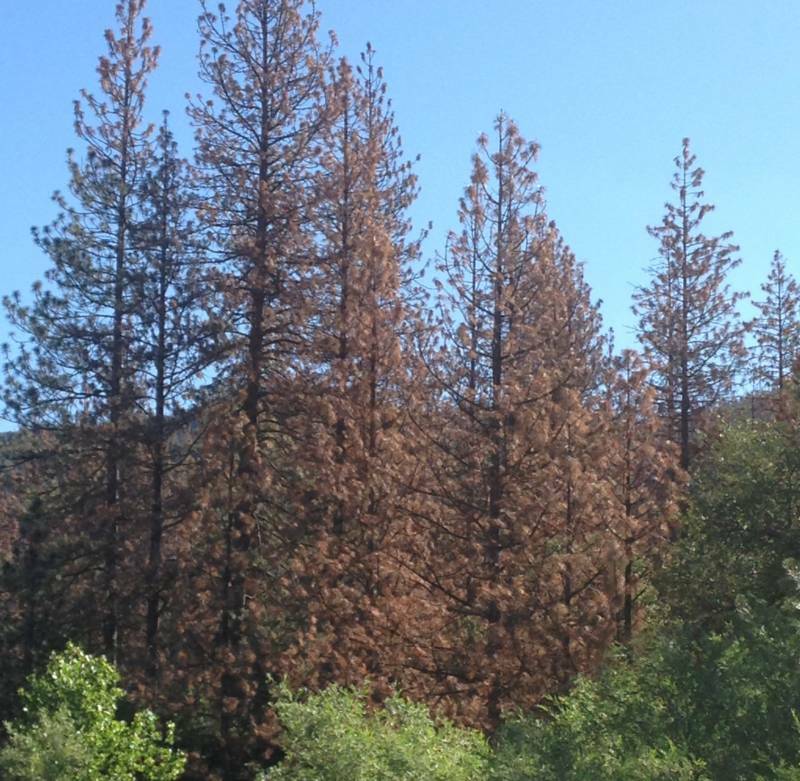 Trees dead because of drought, beetles, wildfire, Sudden Oak Death and other causes. The grasses spread fire quickly, he says. Normally cattle would be up here grazing it down, but ranchers sold off a lot of their herds during the drought. Raines says Cal Fire is prepping early for a tough season, with new equipment that can shred dead trees. Governor Jerry Brown’s state budget includes about $30 million for Cal Fire to take out dead trees near buildings and roads and to provide grants for mountain communities like Pinehurst. A statewide task force is helping to coordinate projects to remove dead trees near power lines, home, and roads -- the places where they could cause the most damage. The local Fire Safe Council that serves Pinehurst and surrounding communities just got a grant from this fund to get rid of dead trees along county roads. The wet winter dropped a lot of moisture into the forests, says Scott Stephens, a fire scientist at UC Berkeley. That's delaying the fire season by a couple of weeks, he says, but mostly in the northern part of the state. The chaparral down south didn’t get much rain. “Southern California, San Diego, LA counties,” Stephens says, "I think they’re in difficult shape." And the number of wildfires and acreage already burned this year is about on par with last year. Climate change, drought, stressed and dying trees, forests that are too dense -- these are all things that may add up to the new normal, Stephens says. Unless the forests are thinned and repaired, massive fires are inevitable. “The forest we know today won’t be the forest our grand-kids know in 30 years unless we start to change trajectory and do higher amounts of restoration,” Stephens says.